When it comes to the subject of community, David E. Kelley--the prolific writer-producer behind television's The Practice and Ally McBeal--falls somewhere on a continuum between directors Howard Hawks and Robert Benton. While Hawks's professional characters are bound by a knowledge of how to do what they do even if they don't know why, Benton's people, professional or not, have long ago substituted their own eccentric reasons for that elusive why. Thus we get the kind of in-house, oddball rituals sandwiched between passages of actual work on Ally, and the affectionately entangled personal and professional ties between small-town folks in Kelley's earlier TV series Picket Fences. 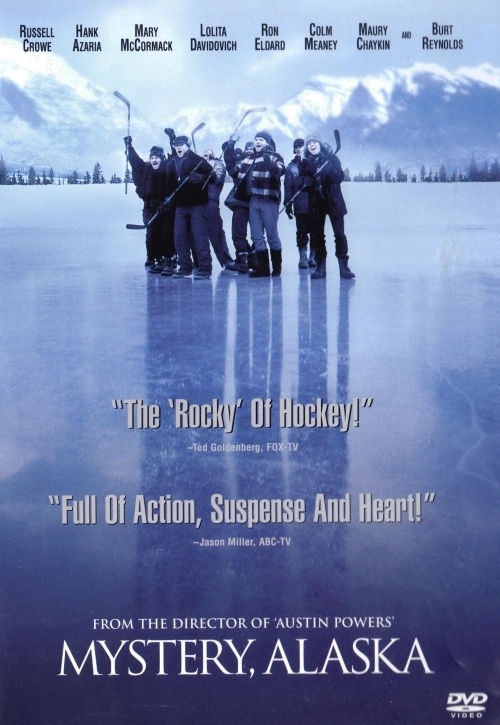 Kelley's script for Mystery, Alaska (co-authored by Sean O'Byrne) takes that level of eccentricity to a geographical and spiritual extreme. The film revives the hackneyed Rocky formula, setting a lopsided hockey match within a remote, self-contained hamlet where the members of a tiny population all have to wear multiple hats and still keep neighborly ties intact. The story concerns the town's chief source of identity and pride: so-called "Saturday games," in which local men divide into teams and play pond hockey for the locals. When a prodigal son (Hank Azaria) of Mystery shows up with a television network offer to bring the New York Rangers in for a televised match against the homegrown team, the town fathers agree. Coaching falls to the town sheriff, John Biebe (Russell Crowe), an admirable man and a longtime player recently bumped from the team. John, however, doesn't want the job: everyone knows the real coach in those parts is Judge Burns (Burt Reynolds), but he wants no part of it either. All of that changes after a sad tragedy forces everyone to reevaluate their positions and pull together in order to beat the Rangers. Following the success of Austin Powers: International Man of Mystery, Jay Roach proves to be an able director of drama, swift action, and low-key, character-driven comedy not unlike that in Benton's Nobody's Fool. He has to deal with some pure corn at the end, but Roach pulls it off and guides the actors to and through far better moments.